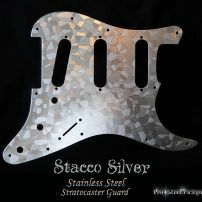 commented on "Stacco Silver Strat Stainless Steel Pickguard Fender SSS Stratocaster Chrome Metal Guard"
A Special Design of fine detail, multi faceted etched Stainless Steel in a classy guard to bling your best Strat to 'wow' status. 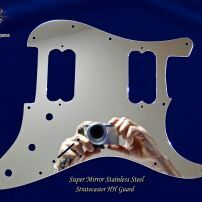 commented on "Gibson SG Standard Super Mirror Stainless Steel Pickguard Set Tenon Cover Truss Cover Chrome Guard"
Chrome Bling Love For Your GIBSON SG, a perfect fit for plastic or metal humbucker rings, a 3 Piece Set made of Super Polished Mirror Stainless Steel. Worldwide Airmail. 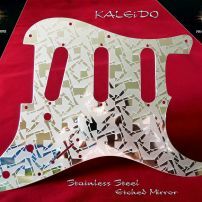 commented on "Kaleido Etched Mirror Fender SSS Stratocaster Pickguard Stainless Steel Strat Guard"
SOLD OUT (new cuts before end December) - Polished mirror with a permanently etched star-like pattern, a durable alternative to a full mirror guard, the etched design covers about 55% with the remaining mirror catching light reflects to the back row. 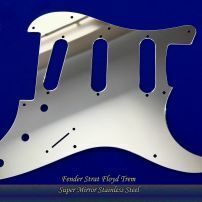 commented on "Super Mirror Pickguard Fender Stratocaster Stainless Steel Metal Chrome Guard"
commented on "Floyd Rose Strat Guard ProSteel Pickguards Chrome Super Mirror Stainless Steel Fender Stratocaster"
commented on "Super Mirror Pickguard HSS Fender Stratocaster Stainless Steel Metal Chrome Guard"
commented on "Super Mirror HH Fender Strat Stainless Steel Pickguard Chrome Metal Stratocaster Guard"
commented on "Silver Nova Tele Stainless Steel Pickguard set Fender HH Telecaster guard and control plate chrome"
This Tele guard duo will spark a wink even in the darkest of funky backstage alleys. Not a guard for stealth. 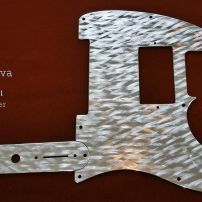 Tele personality with a cascade of silvery bling, just as alive under colored lights. Silky smooth & built for frenzied action. 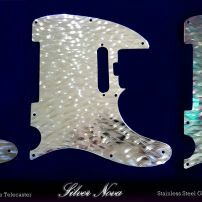 commented on "Silver Nova Tele Elite Pro Steel Pickguards hand machined stainless steel Fender Telecaster guard"
Silver Nova adds an ultra dynamic quality to the supreme surface light reflects that stainless steel is best at. Will kick back reflects from any angle. 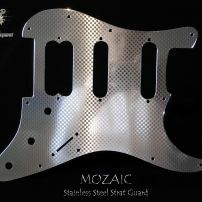 commented on "Mozaic HSS Stainless Steel Fender Stratocaster Pickguard Metal Strat Guard"
A classic chequered pattern etched into polished stainless steel. 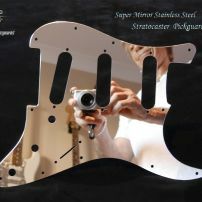 It's the sleek and very durable choice. 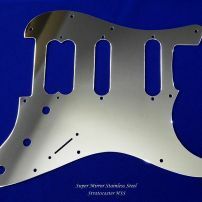 For Fender Strat HSS USA MiM. Click for detail.